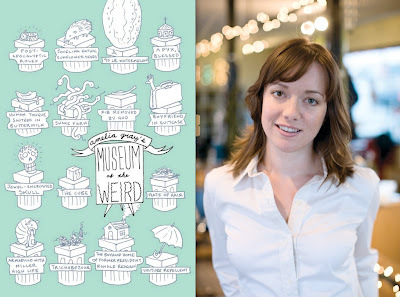 In the 52nd in a series of posts on 2010 short story collections entered for The Story Prize, Amelia Gray, author of Museum of the Weird (FC2), discusses what she leaves out of stories and her fascination with labor statistics. Describe one of the stories in your collection. My story "Babies" is about a woman who gives birth to a baby overnight, without knowing she was pregnant. She feels mixed about the idea but warms up to it, as does her boyfriend. The next morning she has another baby, and they're surprised but adaptable. In the coming days there are more and more babies, and that is the end of the story. The story is written in the style of a fable, and is silent on some otherwise important details like whether or not the woman has health insurance, or what her parents might think, or if she's ever wanted a baby or has a history with babies, etc. I think it's interesting to play with leaving details out in short stories, to let the reader fill them in unconsciously or keep them blank. In a short story you can experiment a lot with the canvas and the paint and still make something recognizable. What is your writing process like? I get up in the morning and write, working on something I'd been working on the day before. Some stories happen all at once later in the day or at night. I wrote "Babies" in about half an hour, sitting on my bed with my laptop propped up against the green wall in a house I lived in between 2006 and 2007. For shorter stories, the generative process is usually shorter and the revision process is long. "Vultures" is the earliest story, which I wrote over the course of 3-4 months in 2005 and revised heavily for about a year after that. What kind of research, if any, do you do? Research is some fun. I write marketing copy for a living, which requires me to spend most of the day on the Bureau of Labor Statistics website. Because of this, I know that there were 3,280 floral designers employed in Texas in 2009, and that they earned mean annual wages of $22,750 that year. There are 50 people employed as travel guides in Texas, they earned $36,440 in 2009. As a writer, research is a good way to get out of one's head a little, but moderation is important. I remember reading somewhere that Joyce Carol Oates was very interested in a serial killer in Tucson, my hometown. She was interested enough to turn the event into her story "Where Are You Going, Where Have You Been?" but she mentioned in an interview about it that she only read the account of the actual events just one time in a magazine article and put it away. Her impulse was to not get too wrapped up in the facts of the case, and that was a smart impulse that lead to a good story. My own stories will sometimes grow from research I've done online, but again, too close a focus makes it more of a fascinated retelling of facts than a piece of art. Maybe someday I'll write a good story using the Bureau of Labor Statistics. Have you ever written a short story in one sitting and not revised it later? No, I'm obsessed with revision. I'll go back and revise stories I wrote years ago, things that will probably never be published. I revise mentally on stage at readings. The fact that good writing can always get better makes it a puzzle. It can become a compulsion in the same way that eating your own hair is a compulsion, and it's one with a more satisfying outcome than a mass of indigestible material in your gut.